Continuous Monitoring – 24/7, the ammonia level can be determined with a quick glance. NO chemicals, test kits, or procedures are required. Long Lasting – 6 months. Easy to Use – simply attach to inside of cage and observe color change. Reversible – no need to replace sensor after exposure to ammonia. Chain – easily attach to any wire cage wall or animal toy. Patented Sensor Technology – state-of-the-art ammonia detection and ammonia monitoring technology. “Low” = ammonia level is 0-1 ppm (a safe level); “Medium” = 1-25 ppm (a change of bedding or cage cleaning is recommended); “High” = 25-50 ppm (toxicity is reached and animals are being harmed); “Danger” = 50+ ppm (a severely toxic level and fatality may result after prolonged exposure). When humidity is > 50% use side labeled “High humidity”; when humidity is < 50% use side labeled “Low humidity”. To test the sensor, place it over the mouth of a bottle of ammonia (Windex window cleaner for example). It should change color within seconds if properly working. WARNING: Changes in humidity affect sensor color and the amount of air movement can affect sensor reaction time. KEEP OUT of direct sunlight. Avoid touching sensor material. Little if any ammonia is found in a healthy system and the sensor will look typically light-yellow/orange. Watch for rising ammonia. Exposure to increasing levels changes the sensor to shades of green, blue, and gray. When ammonia decreases, the sensor color accordingly reverts back to yellow, but the color change is slower. A sensor response of grey or dark blue indicates extremely hazardous ammonia levels (50+ ppm). 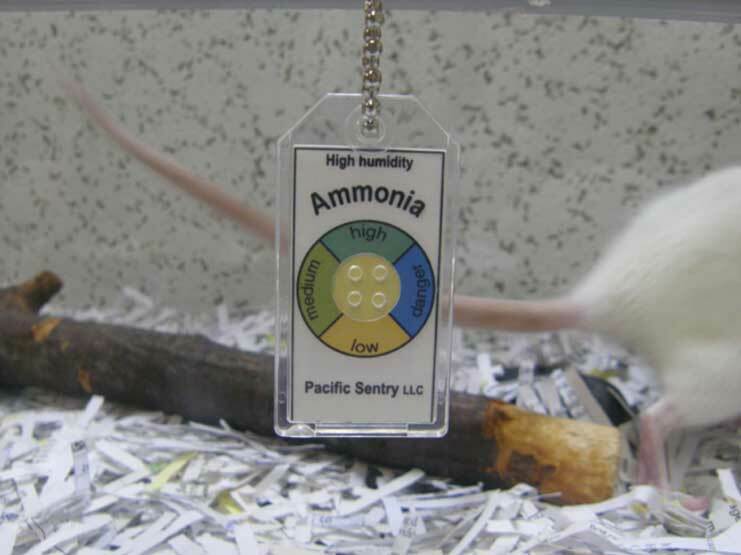 Even prolonged exposure to low levels (1-25 ppm) of ammonia increases susceptibility to disease and infection. Take appropriate action to reduce ammonia and alleviate the toxic risk. 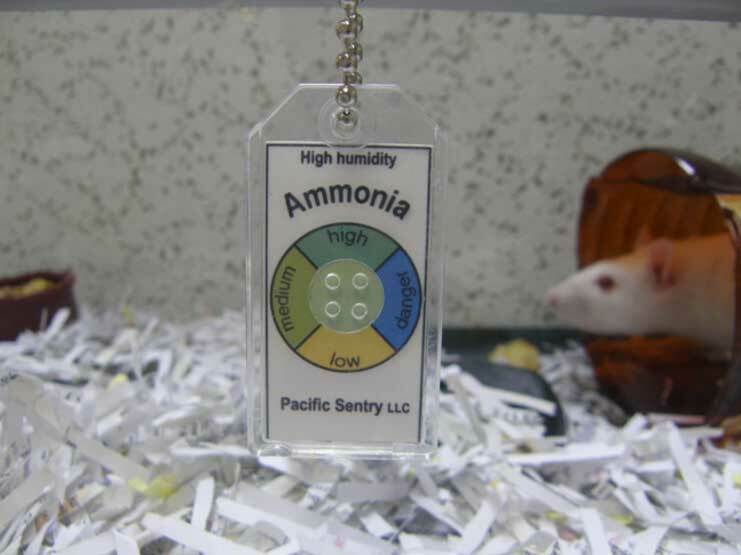 Pacific Sentry’s Small Animal Ammonia Sensor is designed to be highly sensitive to ammonia. This provides the earliest possible indication of ammonia increasing in the environment; thus the highest level of protection, lowest risk of toxic injury, and a greater margin of safety for taking corrective measures. The useful lifetime of the sensors can be influenced by a number of factors that vary from cage to cage. Though unable to predict for your particular conditions, it should be useful for 6 months, before needing replacement. Gradual fading of sensor colors over time is to be expected. Exposure to direct intense lighting, for instance, can influence this, and is best avoided. Buy your sensors online by clicking the “add to cart” button on the Products page or call (425)-229-9701 and talk directly to a representative to place an order. Custom fabrication requests are also welcomed; call or email for details. We will gladly work with you to design the best solution that meets your needs. Products will be shipped within 2-4 business days. Ground shipping usually takes 3-5 days depending on shipping destination. International shipping and handling depends on the specific country. Please email Customer Service at info@pacificsentry.com with your shipping address, product of interest and desired quantity. A shipping estimate will then be provided. If you are not satisfied with our product for any reason, please return it within 14 days of receipt for full refund.